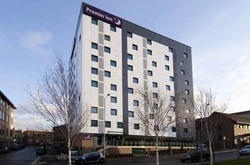 Great central location right in Bradford city centre, within easy reach of the M62 and M606 and a short walk from Bradford Interchange railway station.Premier Inn Bradford has a good restaurant providing a full menu of great value meals and snacks. Local attractions include the Alhambra Theatre, National Media Museum and the beautiful Yorkshire Dales. Looking for Premier Inn deals in Bradford? Book direct for the best price.